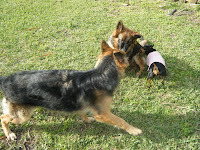 Yesterday I blogged about our 2 "stinky dogs". They were very upset with me and asked that they be able to write their own blog today. So, without further ado I introduce you to todays guest bloggers...Piper and Cricket! "Yesterday Mommy told everyone that we were smelly! Well, that may be, but geeze, did she have to tell everybody? We are just babies and we get dirty and we do NOT like to go and let other people put their hands all over us. We don't know where their hands have been. Also, at that "smart pet" place that Mommy talked about, they put a noose around your neck! That was scary! But, what we really want to talk about today is the little dog that lives with us. She laughed at us yesterday when she read Mommys blog! How mean! The little dog stinks too! Mommy didn't tell you that, but she DOES! Mommy gives her a bath because she is little and doesn't fight very much (because she is dumb and we are smart cuz we went to school and graduated and everything) then Mommy sprays smelly stuff all over her. WOW, talk about stinky! Mommy says she smells like vanilla or something but she kinda smells like butter crackers! Momma says Mommy smells like butter crackers too but Mommy smells good. The little dog does not! 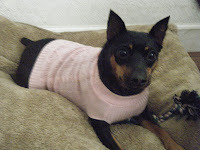 The little dog also wears a pink sweater when she goes outside. HA, a PINK sweater. How dorky. We try and try to bite the pink sweater off so she will look like a real dog (Momma says she is not a real dog) but Mommy yells at us to stop biting her. We are NOT trying to hurt her, we only want to help...most of the time! 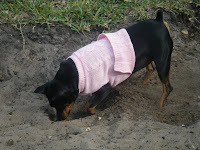 We know she has short hair and it has been a bit cold here but seriously, a pink sweater...just "DOG UP"! Another thing about the little dog that bothers us is that the little dog barks and barks when the Mommas start to go anywhere! We do mean ANYWHERE! Momma says she is a "nutter" and needs medication and that makes Mommy mad sometimes. We are not sure what a "nutter" is but we think she is crazy! Why ya gotta bark like a goof? That is not gonna stop the Mommas from leaving and for petes sake, they are gonna come back. She is just a big ole baby! See Momma, it is NOT us! Anyway, we just wanted to let everyone know that we may be a little icky sometimes but it's not all that bad. At least we are real dogs! Just ask Momma! She knows cuz she knows everything and she says the little dog is really just a rat. So take that you little butter cracker, pink sweater wearin', nutter princess rat! Who's laughing now??? "I will not lower myself to the big dogs level by commenting on this slanderous drivel. I pride myself on maintaining the highest level of dignity and tact. Therefore, I will simply ignore this piece of fluff as I tend to ignore the big dogs. I must run now and hide all of the big dogs favorite toys! Have a splendid day!" Juno, AKA "the little dog"